School psychology graduate students passed out candy and shared information about their future career field during School Psychology Awareness Week. 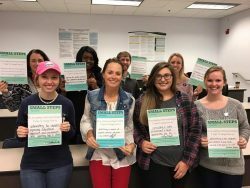 If you were on Georgia Southern University’s campus this week, you may have noticed students wearing stickers that said “Ask me about school psychology!,” or perhaps you saw the hashtag “#SmallStepsChangeLives” trending on social media. November 14-18 was School Psychology Awareness Week 2016 (SPAW), and College of Education graduate students in the Ed.S. School Psychology program created several activities to educate others about the field of school psychology. On Monday and Tuesday, student leaders from the school psychology program and the School Psychology Student Association (SPSA) set up an information table in the University’s Carroll Building. Targeting undergraduate students pursuing liberal arts and social science degrees, program volunteers passed out candy, shared information about their degree program, and encouraged students to learn more about a career in school psychology. Program representatives also attended the University’s Undergraduate Psychology Bash where they were able to share information about the specialty area of the school psychology and career opportunities with current psychology undergraduates. All week long, candidates of the Ed.S. School Psychology program also wore stickers encouraging passersby to “Ask me about school psychology!,” and candidates took to social media to share their thoughts about the 2016 SPAW theme “Small Steps Change Lives!” with the SPAW poster activity. Jessica Miller, a graduate assistant for the school psychology program and volunteer coordinator for SPSA, said undergraduate students were very interactive in the activities that took place throughout the week. Additional activities included a SPSA sponsored student panel where current interns and practicum students in the school psychology program engaged in a dialogue about their field experiences with other individuals in the graduate program. Associate Professor Dawn Tysinger, Ph.D., NCSP (pictured front row, second from left), and her Ed.S. School Psychology graduate class participate in the SPAW poster activity. Miller explained that educating the students at Georgia Southern about the school psychology discipline is important because of the impact that professionals in this field can make for students. School counselors often serve the entire school population with focus on the academic careers of students. School psychologists, however, focus on proper adaptation and response to school environment. They are tasked with assisting students who are facing mental health, learning, and behavioral barriers to their education. Their common roles in schools include consultation, academic intervention, behavioral intervention, assessment, individual counseling, group counseling, and crisis intervention. Miller also explained that there is a national shortage of qualified professionals in this field. “Due to this critical need, it is paramount to inform undergraduate students about our profession and encourage them to pursue a career path in school psychology,” she said. 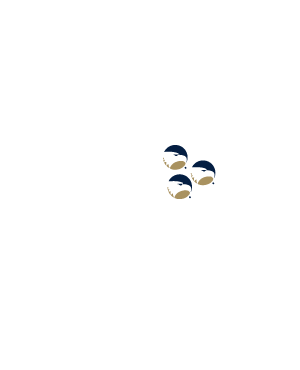 To learn more about Georgia Southern University’s Ed.S. in School Psychology, please visit https://coe.georgiasouthern.edu/espy/eds/. For more information about the career field of school psychology, visit the National Association of School Psychologists website at https://www.nasponline.org/.